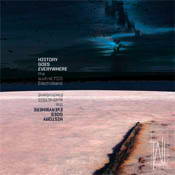 Finally if jazz is your music of choice you might enjoy History Goes Everywhere featuring AustraLYSIS Electroband. It’s not always an easy listen but there is plenty here to admire and enjoy with its mix of computer, piano, saxophone and spoken word. Greg White’s Processual features Sandy Evans’ saxophone skipping over synth clouds and taped loops increasing in intensity and reaching a close harmony climax before fading out. Roger Dean’s The Blue Bus showcases a text by Hazel Smith which references black woman Rosa Parks’ historic bus ride which sparked the Civil Rights Movement bus boycott in Montgomery Alabama. After the relentless stabbing keyboard of Dean’s Harmonic Moves there’s a little oasis of melodic refreshment in his tribute to 18th century French Baroque composer Louis Couperin. This is the longest track at 12-plus minutes and starts off acoustically with piano and Evans soprano sax before White’s computer takes us to deep space. Anything involving saxophonist Evans is, in this reviewer’s estimation, well worth a listen but many might find this album less user-friendly than her other work. The opening here is electronic – a shimmering, trembling overall pattern of overtones or moire patterns. It is like the eerie sky of a planet, invisible to us, that is perilously close to the sun. Close to ignition in fact. Another overall effect rises within that field, that is like a high, wailing brigade of sirens. Over the the slowly changing electronic fields, Sandy Evans skitters, angles and jumps on soprano saxophone, sometimes releasing a high keening note of some emotional force. Moire, incidentally, usually refers to watered silk but is also applied to parallel streams of odd number intervals, graphic or sonic, that may form clumps of uneven relationships or dissonances. On the second track Hazel Smith delivers a recitation or perhaps prose poem – called The Blue Bus – through the textures and movements of the group. While this is replete with many clever and amusing sentences, I found myself agonising over whether I really liked it. I decided to leave this in neutral (particularly as a deadline loomed). It is but one track after all, and I am but one listener. On track three a kind of one and one and one unaccented chordal pounding down near the bottom of the piano – but pianistic treble figures fly overhead – sometimes so fast they slither, barely differentiated, and sometimes tinkle like breaking crystal – until a sudden deceleration and disassembly introduces a more lyrical slower tempo. This sets up some of the elements in play. Oh, also: ghostly electronics sometimes take over and draw us out into a considerable sonic distance. History Goes Everywhere and space travels freely too on this disc. As I say, I love it. Specially the interplay of grand piano and electronics. This too is music for sitting and listening, for walking around, for staring out the window at the flight of birds, the fall of a leaf, traffic, the patterns and movements of industry and nature. Hope you join the club, but you may not enlist on first hearing. Bus Stops In History is a particular favourite of mine. Here Sandy Evans’s tenor saxophone enters.